Discover the stories behind the artworks in the exhibition O’Keeffe, Preston, Cossington Smith: making modernism in this series of talks. Note: Paula Dredge will now speak on 16 August, not 23 August, and Denise Mimmocchi will speak on 23 August, not 16 August, as previously advertised. The Gallery apologises for any inconvenience. Paula Dredge, the Gallery’s head of painting conservation, will discuss her work on the paintings in preparation for the exhibition. Denise Mimmocchi, the Gallery’s senior curator of Australian art and co-curator of the exhibition, will discuss the major themes and key works. 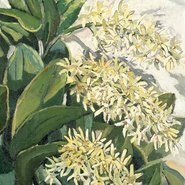 Louisa Murray, the flora botanist at the National Herbarium of NSW at the Royal Botanic Garden, Sydney, will talk on the plants that feature in the works of Margaret Preston.